Thirty years ago, a high school senior forever changed the game of cutting class. Of all the wild antics Ferris and friends enact during their day off – stealing a car, dancing in a parade, faking an identity to gain access to a fancy restaurant – perhaps the most surprising, yet significant, is their stop at the Art Institute of Chicago. The scene, an ode to John Hughes’ personal admiration for the museum, takes the film from feel-good teen flick to thought-provoking cinema, and establishes its place among the best museum movies of all time. Set to The Dream Academy’s cover of The Smiths’ “Please, Please, Please Let Me Get What I Want,” the scene filmed at the Art Institute of Chicago is undeniably odd, and not just because its three teenagers playing hooky by going to a museum. The style of the scene more closely resembles a music video than a feature film, with its unusual lengthy close-ups, lack of dialogue and dreamy background music. Yet, that scene is perhaps the pivotal moment in the development of Cameron, whose existential, bleak outlook on life clashes with Ferris’ eternal enthusiasm. “It’s an important movie, but it’s one that ages well. I’ve seen any number of high school movies and they are painful now. You had to be in the moment in order for them to matter. This one aimed higher and it succeeded,” says Eleanor Harvey, senior curator at the Smithsonian American Art Museum. Unlike Ferris and Sloane, who remain happy and carefree throughout the film, Cameron is constantly wrestling his inner demons. He reluctantly follows Ferris’ lead, and at the museum, he plays along with Ferris and Sloane’s spoof of the art-going experience, mimicking the positioning of a Rodin statue and running through the gallery with a group of children. But once separated from his friends, Cameron finds himself in a moment of serious introspection in front of George Seurat’s A Sunday on La Grande Jatte. The camera cuts back and forth between Cameron’s face and the face of the young girl at the center of the pointillist painting. Inching closer to the canvas with each cut, the camera is eventually so close to her face that it is no longer identifiable as such. While Ferris and Sloane are, perhaps alarmingly, confident in who they are, Cameron is constantly searching for his raison d’être. Just as the little girl in the painting faces a different direction from everyone around her, Cameron is experiencing life differently from his peers and particularly his best friend. In this little girl, Cameron begins to understand himself. “Cameron could not have anticipated that this would be anything but a fun goofball day and in a sense that painting becomes our first concrete clue that Cameron is deeper than everyone else in that movie,” says Harvey. Says Harvey, "Cameron needs to realize going through life scared is the wrong way to do it. That encounter with the painting in some weird way gives him the courage to understand that he can stand up for himself." Neither Ferris nor Sloane undergo much in the way of character development during the film, their private moment at the Art Institute is revealing in itself. As Harvey notes, Ferris and Sloane have differing ideas on the future of their relationship. As Ferris has clearly checked out of high school and is ready to move on, Sloane’s crush on him only intensifies during the film to the point of her telling Cameron, “He’s going to marry me.” When separated from Cameron, Ferris and Sloane find themselves in front of Marc Chagall’s “America Windows,” or what Harvey calls an “ecclesiastic stained glass in a kiss that could be in front of an altar,” supporting Sloane’s marriage fantasy. The beauty of the quirky scene, set right before Ferris’ jubilant takeover of Chicago’s Von Steuben Day parade, is in its affirmation that art has the power to impact people in profound ways, and museums are critical in facilitating that. “I think in a certain sense [the scene] mirrors the journey into an art museum or any unfamiliar territory. You start thinking it’s a lark and then you make fun of it and then you begin to realize that there’s power here and you either reject it or you dive in,” says Harvey. 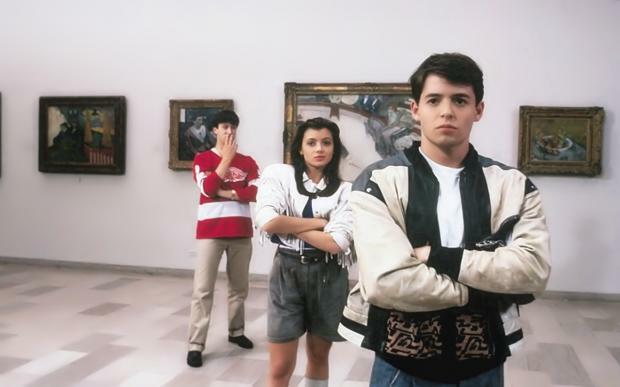 So, the next time you’re at an art museum, remember Ferris’s sage advice about life moving pretty fast. If you don’t stop and look around, you might just miss an opportunity to learn something about yourself.